The long lines evident on Phobos look like electric scaring to me. Comments? 3D MOON OF MARS: Grab your 3D glasses. Two weeks ago, NASA's Mars Reconnaisance Orbiter (MRO) targeted martian moon Phobos and took a pair of high-resolution pictures. Mission scientists have combined them to make a startling red-blue anaglyph. Glasses on? Long ago, something struck Phobos and almost shattered the tiny moon. The scar of that impact, 9km-wide Stickney crater, is located at the top of the image. Color filters in MRO's camera reveal a blue splash of material around Stickney's rim. What is it? No one knows. Equally striking are Phobos' many long grooves and crater chains. Although these seem to radiate from Stickney, recent studies show that most are not related to the crater. Instead they come from the planet below; when asteroids hit Mars, debris flies up and scores Phobos. The grooves seem to emerge from Stickney only because the crater faces Mars. Finally, note the bright features lining inner slopes of Stickney. These are thought to be landslides--on a moon where the pull of gravity is only 0.001 g! Last edited by nick c on Fri Mar 25, 2011 10:43 am, edited 1 time in total. 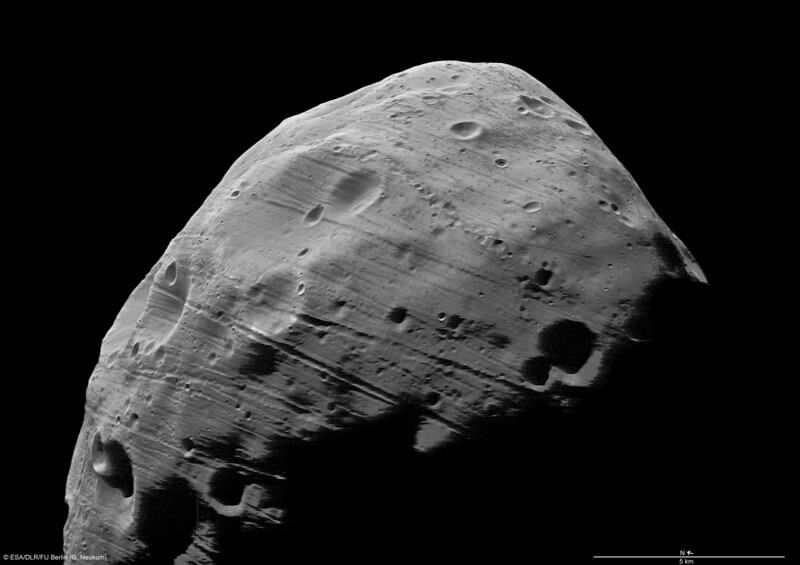 Great image of Phobos, almost looks like a comet nuclei. It's surprising to see so much colour. It's interesting that Stickney crater is on the face that is locked to Mars (how does such a small body become tidally locked in the first place?). I think the popular opinion is that it was formed by debris blasted up from an impact on Mars. I read that the long lines on Phobos are fractures caused by the formation of Stickney crater although I don't like this explanation. Hmmm. Deserves a little closer inspection I think... especially those long lines junglelord mentions. NASA wrote: A series of troughs and crater chains is obvious on other parts of the moon. Although many appear radial to Stickney in this image, recent studies from the European Space Agency's Mars Express orbiter indicate that they are not related to Stickney. Instead, they may have formed when material ejected from impacts on Mars later collided with Phobos. The lineated textures on the walls of Stickney and other large craters are landslides formed from materials falling into the crater interiors in the weak Phobos gravity (less than one one-thousandth of the gravity on Earth). So just what is it that caused such straight, long chains of craters numbering in the lots and lots? This is one excellent rock to have a look over, especially with the resolution available at the NASA site above. There's even higher res available from the HiRise site itself. I think Phobos raises many more questions for the standard model than it supplies anwers for. This reminds me of similar scars on the moons of Uranus. Almost on-topic: the bright markings on Phobos. Electrically-gouged grooves and chained craters (some criss-crossing) emanating from and around Phobos' Stickney crater, and the mysterious 'light bluish' areas (APOD April 10, below). Explanation: Stickney Crater, the largest crater on the martian moon Phobos, is named for Chloe Angeline Stickney Hall, mathematician and wife of astronomer Asaph Hall. Asaph Hall discovered both the Red Planet's moons in 1877. Over 9 kilometers across, Stickney is nearly half the diameter of Phobos itself, so large that the impact that blasted out the crater likely came close to shattering the tiny moon. This stunning, enhanced-color image of Stickney and surroundings was recorded by the HiRISE camera onboard the Mars Reconnaissance Orbiter as it passed within some six thousand kilometers of Phobos last month. Even though the surface gravity of asteroid-like Phobos is less than 1/1000th Earth's gravity, streaks suggest loose material has slid down inside the crater walls over time. Light bluish regions near the crater's rim could indicate a relatively freshly exposed surface. 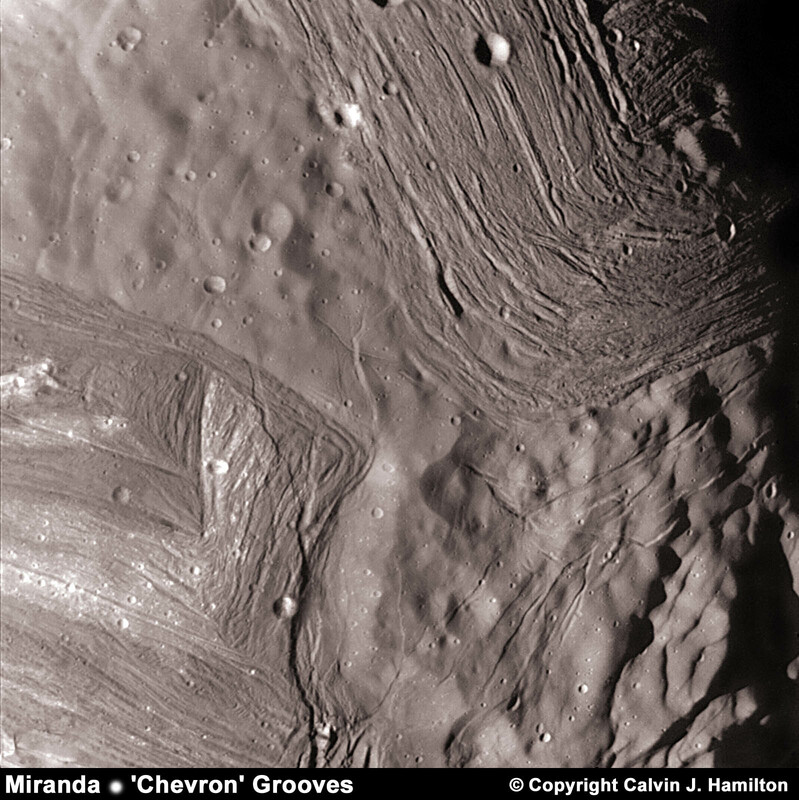 The origin of the curious grooves along the surface is mysterious but may be related to the crater-forming impact. Revisiting PHOBOS. Close flyby pics of Mars Express. 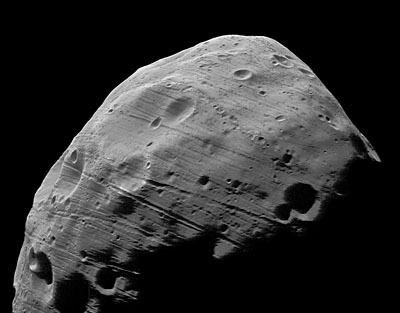 The ESA spacecraft Mars Express managed a close encounter of 93 kms of Martian moon PHOBOS on 23 July. Along with phantastic pictures and scanning for a possible landing site for a future Russian landing mission. Me thinks the "debate" is missing one crucical possibility for the origin of those scars. Do you think the same? Re: Revisiting PHOBOS. Close flyby pics of Mars Express. Notice the crater at left. Notice the groove travels over hill and dale. Ain't no fluid erosion, unless it's a squirt gun from the outside. EDM could probably do it. Granted it would have had to be some big, powerful filamentary currents to do it on that scale. I don't buy the "internal fissure" hypothesis. 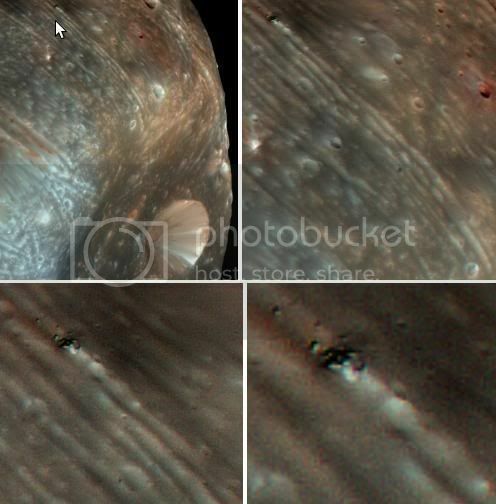 The fissures would have to basically ENCIRCLE Phobos! And what would cause fissures all the way around the body of the thing without basically fracturing it to pieces? Why are all the grooves in more or less the same direction? MGmirkin wrote: I don't buy the "internal fissure" hypothesis. The "internal fissure" hypothesis is more of the same old stuff, isn't it? We have an enigma, so let's put the cause in the interior of the celestial body where it can't be falsified...at least not in the forseeable future. Let's see, along with internal fissures, the same approach has served mainstream well...internally generated planetary dynamos, internally nuclear powered sun/stars, internal ice cores for comets, etc. MGmirkin wrote: ... internal ice cores for comets, etc. I occasionally trawl through Richard Hoagland's Enterprise Mission site, not because I believe his theories but because it occasionally throws up anomalies in NASA and ESA space discoveries. This little gem is one of his new foci. He believes it proves Phobos is man-made akin to his favourite theoretician Gene Roddenbery. I think it displays all the hallmarks of plasma arc machining. It also brings into question the basic presumption of gravity equations the ESA used to make these statements about the mass of all celestial bodies. The question is what is really hollow the moon or the theory? The evidence just keeps mounting for an electric cause. This also from Geophysical Research Letters:"
... plasma and magnetic field effects in the solar wind near Mars suggest[ing] that a neutral gas (dust? )torus/ring resides along the orbit of the Martian satellite Phobos. Magnetic ‘cavities’(strong decreases of the magnetic field strength) coincident with strong plasma density increases (up to a factor of ten) are observed during the first elliptic transition orbits when the spacecraft approached the Phobos orbits ...."
-- "Indirect Evidences for a Gas/Dust Torus Along the Phobos Orbit ..."
vadar wrote: Almost on-topic: the bright markings on Phobos. Amazing photos....would "light bluish" regions probably be areas of continued electrical discharge. ?